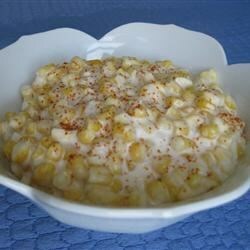 Place corn kernels, whipping cream, milk, salt, flavor enhancer, sugar, and white or cayenne pepper in a large stockpot. Bring to a slow, low boil beginning on medium heat, stirring frequently. Simmer for 5 minutes on low heat. Melt butter in the microwave, or in a small saucepan on low heat. Whisk in flour until smooth. Stir into the corn until well blended. Enjoy! See how to make the tastiest creamed corn of your life. Way better than canned! This recipe is good, but I'm looking for another one I found that was a little different. The taste wasn't quite there on this one. Super easy and delicious. I made half the recipe exactly as written using cayenne pepper and no MSG. Just before serving I added shredded parmesan cheese.